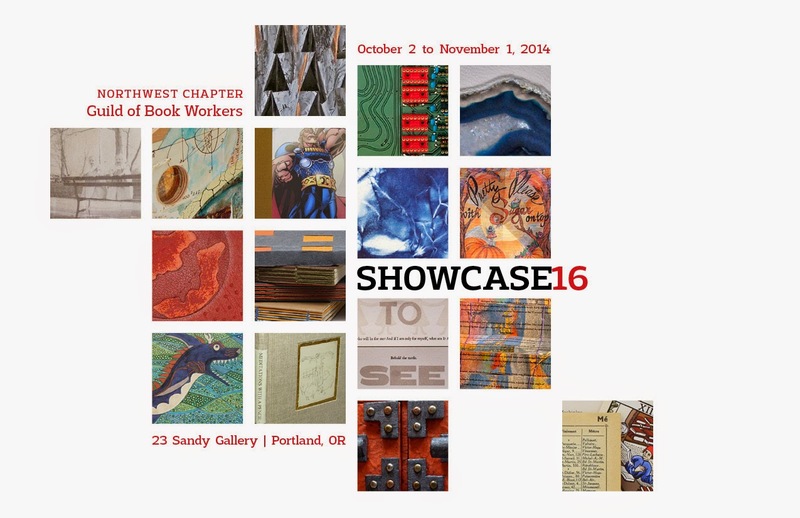 The Northwest Chapter of the Guild of Book Workers invites you to celebrate its 11th year with a member exhibition.This exhibition showcases the diversity in the art and craft of the book: historical, traditional, experimental and fine bindings, conservation work, sculptural artists’ books and book objects, miniatures, pop-ups, blank books, and letterpress and digital editions. Participating artists, front, left to right: Alicia Bailey, Susan Collard, Jodee Fenton, Mari Eckstein Gower, Patricia Grass, Ealasaid Haas, Karen Hanmer, Barbara Hebard, Paula Jull, Joanne Kluba, Bonnie Thompson Norman, Randi Parkhurst, Todd Pattison, Laura Russell, Carole Sauter, Elsi Vassdal Ellis. Artists Reception: Saturday, October 4, 2014, 4-6:00 p.m. Annual Members Meeting: Saturday, October 4, 2014, starting at 6:00 p.m. The Guild of Book Workers was founded in 1906 to “establish and maintain a feeling of kinship and mutual interest among workers in the several hand book crafts.” Among its early members are well-known artist-craft workers such as bookbinder Edith Diehl and printers and typographers W.A. Dwiggins and Frederic W. Goudy. The Guild still believes, as did its founders, that there is a responsibility among civilized people to sustain the crafts involved with the production of fine books. Its members hope to broaden public awareness of the hand book arts, to stimulate commissions of fine bindings, and to stress the need for sound book conservation and restoration. All are welcome to join and explore the work of and learn the craft of the book arts in all its aspects. More information about the Guild may be found at: http://www.guildofbookworkers.org. All current members and interested book workers are invited to a Members Meeting to be held on October 4, 2104 just after the opening of the Showcase Exhibition. We will meet and walk to a nearby restaurant immediately following the gallery reception.